Golf Magazine, along with the Visa, no longer exist. The information below remains for archival purposes only. 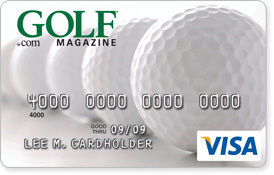 With Golf Magazine’s Rewards Visa you’ll receive The Best Instruction Guide Ever on approval, plus after your first purchase you’ll also receive 1 dozen personalized Callaway Golf Tour ix golf balls — a $44.95 value! For the avid golfer the rewards are 1 point per dollar spent, which can be used for first class golf experiences, name brand equipment and apparel, preferred tee times, and much more. The cards also has an introductory 0% APR on balance transfers for the first 6 billing cycles after the account is approved. There is no annual fee for this card, offers zero liability for unauthorized charges, purchase protections for items lost, stolen or damaged within 90 days of purchase. Every purchase with the B.A.S.E. Camp Children’s Cancer Foundation Visa Platinum Rewards Card helps support research on children’s cancer, beginning with a $50 donation the first time you use the BASE Camp Credit Card. 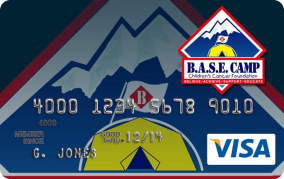 Funds raised from the BASE Camp card program will provide money for on-going programs devoted to children affected by cancer. You can personally help BASE Camp ensure that these special children and families continue to receive support for their vital mission. BASE Camp provides a year-round base of support for children and families who are facing the challenge of living with cancer and other life-threatening hematological illnesses. It serves not only the children who are patients, but their brothers and sisters too. Brighter Planet organization shut its doors in 2013. The information below is no long valid and is presented for the record books. 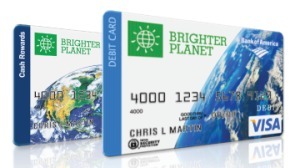 When you use your Brighter Planet Visa Signature credit or debit card to make a purchase, you help fund renewable energy projects across the country. Brighter Planet is a small, committed team based in Vermont, New York City, and San Francisco. It is proud to have some of the nation’s leading technology and sustainability experts on its leadership boards and to partner with a wide range of organizations in developing solutions to the earth’s energy challenges. The information provided below is ONLY for archival purposes. Finance your business purchases at no interest for six months with an AT&T Universal Business Card. Use your card on anything from office supplies to gasoline to dinner with clients. Purchases are eligible for ThankYouPoints, which can be redeemed for gift cards, merchandise, travel and more and with rewards starting at just 1,000 points, AT&T Universal Card will be helping keep your profitable. At tax time use the quarterly and annual account summaries, which are categorized by purchase categories and by employees, to simplify filling out your small business tax forms. Control what your employees spend with individual credit limits for each employee AT&T Universal Business Card. With no annual fee and zero percent interest on balances paid in full every month, AT&T Universal Business Card makes starting a small business that much easier.